Having an RC tank that doesn’t shoot is kind of like having a car that doesn’t drive. It can be cool to look at, but it is still pretty pointless. That is why we put together this review of tanks that shoot, so you don’t have to waste your time with those lame RCs that don’t shoot. When searching for a tank, you want to find one that has good firing range, speed, and agility. Without all three of these, your tank will be a sitting duck on the battlefield. The tanks we included in this review all have these attributes, and more. Another thing that you may want to look for in a tank is features that make it more realistic. Sounds that replicate tank engine sounds, and smoke can all make the RC seem less like a toy and more like a military vehicle, which makes using it that much more fun. 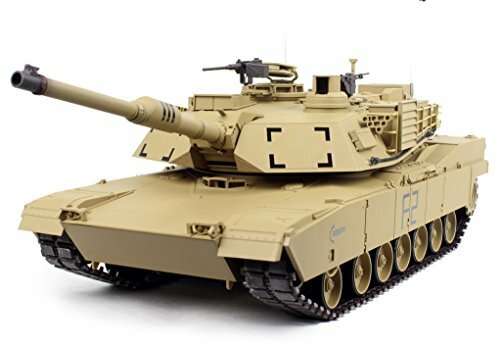 Our top choice for the best RC tank that shoots is the Heng Leng M1A2 Abrams. This tank really makes you feel like you are on the battlefield. With sounds like real tanks make, and the ability to shoot, this tank is definitely the best on the market. 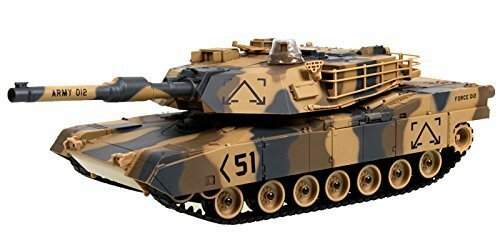 This is a scaled model of the M1A2 Abrams used by the military. 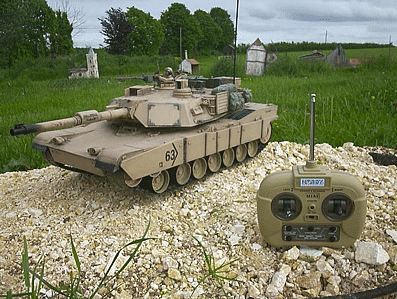 Everything about this tank was made to replicate the real thing. In addition to the tank making accurate sounds, this thing smokes, which really ups the realistic feel of the tank. On top of this, it even has realistic shooting action, recoiling when it fires. The turret movement gives you great flexibility and range with shooting, as it is able to move up and down 30 degrees, and move horizontally 320 degrees. 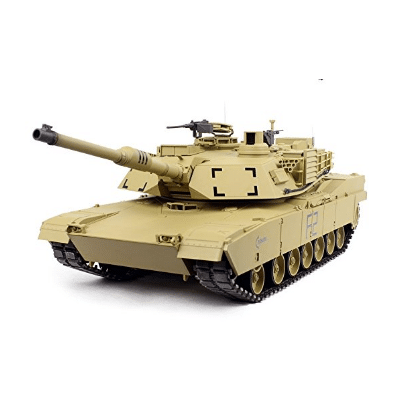 The M1A2 tank is the most realistic tank on the market, and it can be had at a great price. The next best option in our list of tanks that shoot is the Amazing Tech Depot M1A2 Abrams. This tank is also a M1A2 Abrams model. It has almost as many features as the last model, only it is a fraction of the price. The low price of this tank doesn’t mean that the quality is also low. In fact, this is one of the best rated models on the market. The Amazing Tech Depot tank is a great tank for shooting. It shoots 6mm BBs, and has an ammo capacity of about 50 bullets. Having that much ammunition in the hatch can really up the fun. No more having to reload after a few shots, you can do a good amount of damage before having to reload. The tank gives a realistic feel with its engine sounds and recoil after each shot. The cannon has a 20 degree vertical movement ability, while it can move 300 degrees horizontally, allowing you to demolish any nearby threat. The maximum firing range is 9 feet. The tank is equipped with multiple speed control, a high gripping caterpillar, and a 30 foot control range. 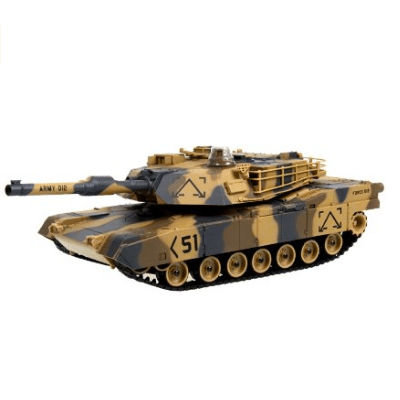 The Amazing Tech Depot M1A2 Abrams tank is an incredible tank. It is very realistic, has many great features, and most importantly, extremely fun. But the best part about the tank is the crazy low price. The third tank in our review is the German Tiger I Battle Tank. This replica of a German military tank really exceeded our expectations. It is super realistic, has great features, and of course comes at a great price. The tank is a 1 to 24 scale model of a German Tiger I tank. It not only has realistic sound, but also has realistic shooting action with a recoiling metal barrel. This tank comes ready to run out of the box, and is quick too. It moves about as fast as you can walk at full throttle. It is even capable of climbing a hill at up to a 30 degree angle, allowing you to conquer any battle field. The cannon shoots 6mm BB bullets, and has a movement range of 20 degrees vertical, and 300 degrees horizontal. The tank holds about 20 BBs. This tank may seem to be a mediocre choice because of its less impressive specs, however, it really is one of the best on the market. 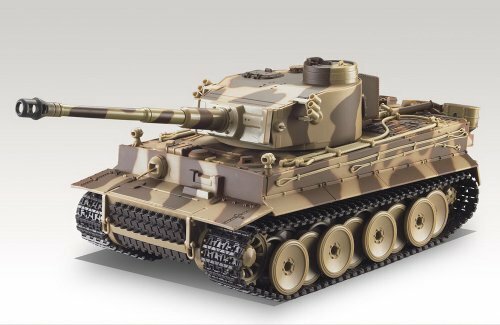 If you are looking for a quality tank at a great price, or just want to buy a german tank, this RC tank is the choice for you. One more reason for you to buy this tank: it is the lowest priced tank on this list. 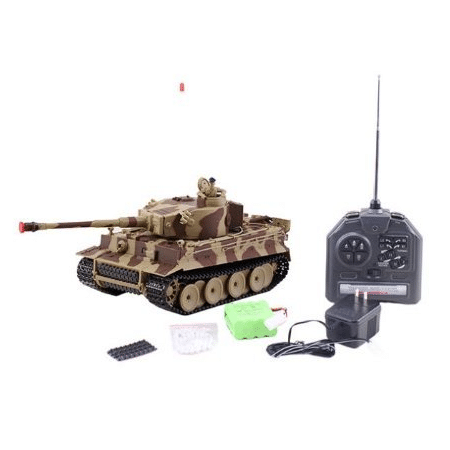 Even though some of these remote control tanks may seem like toys, they have the ability to shoot, and therefore, can be dangerous. We have included some safety tips to ensure that no one “shoots their eye out” while enjoying these fun tanks. 1. Treat the tank like a gun. Assume that it is always loaded, and NEVER point it at yourself or another person. 2. Read all instructions before using the tank to make sure that you don’t lose control. 3. Do not allow a young child or immature person to take control. 1. Aim Slightly above the target if it is far away. Expect the BB to drop a few inches for every foot away from the target. 2. Know the maximum distance of the cannon. Some tanks can shoot 10 feet, while others can shoot 50 feet. Figure out what range yours has, and use it accordingly. 3. When using lighter weight BBs, account for the wind. A small breeze will not usually affect the shot, but heavier gusts will. Also, the further the shot, the more it will be affected by the wind.